It has become something of a tradition for Golden Globe Awards hosts to exhibit an edgy sense of humour, sometimes taking a cheeky dig at the contenders. 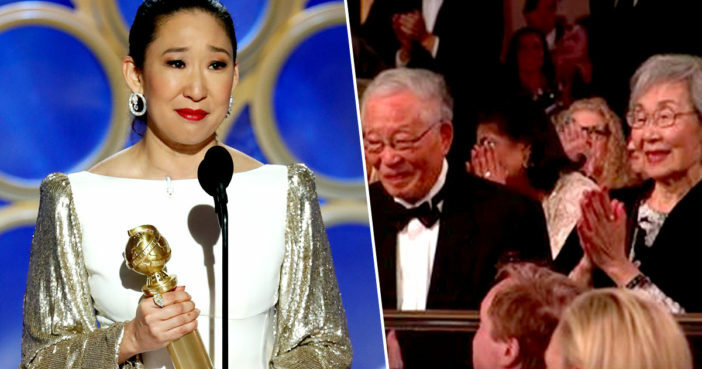 However, a bit of light teasing aside, the talented, and famously lovely, Sandra Oh opted for a far purer approach; making sure to thank her supportive – and very, very proud – parents. Of course, Sandra wasn’t just the witty and beautifully attired host, she was also up for a nomination of her own: the award for Best Actress in a TV Drama. It was no great surprise when Sandra won the award for her role in the outstanding Killing Eve, beating drama heavyweights such as Elisabeth Moss (The Handmaid’s Tale) and Julia Roberts (Homecoming). Mostly, there are two people here tonight that I am so grateful that they are here with me. I’d like to thank my mother, my father. Sandra’s parents could be seen giving their talented daughter a standing ovation, applauding with evident love and excitement. Her father even took a bow, displaying the sort of happiness we all want to bring to our family. A visibly emotional Sandra then bowed in return to her delighted parents, with her joy overflowing to her legions of fans around the world. People loved how heartfelt Sandra’s expression of love was, with her mum and dad quickly becoming two of the most adored individuals of the evening. This moment between @IamSandraOh and her parents on the #GoldenGlobes made me and my parents sob!! This touching footage is made all the more poignant as the evening has placed Sandra firmly in Golden Globes history. Sandra has become the very first performer of Asian heritage to serve as MC at the historic awards ceremony, and is now also the first Asian woman to win a Golden Globe award for best actress in a TV drama for 39 years. I said yes to the fear of being on this stage tonight because I wanted to be here to look out into this audience and witness this moment of change. I’m not fooling myself. Next year could be different. It probably will be, but right now, this moment is real. Trust me: this is real, because I see you. And I see you. All of these faces of change. And now so will everyone else.